Welcome to The Scare Factor! In case you haven’t met us before, our goal is to help thrill-seekers – like you – find Haunted House and Escape Room info through Reviews and a comprehensive database of Directory Listings. Pretty cool, huh? In our continuous effort to promote the industry and raise awareness for local Halloween haunted attractions, we’re excited to announce our 2018 “Top Fan-Voted ‘Must See’ Haunts” voting poll! Starting on Monday, July 9th, haunt-goers like you will have the chance to vote for their ONE favorite Halloween haunted attraction! The haunts with the most votes will earn our badge of recognition and bragging rights for days! But hurry, the polls will close on Sunday, July 29th. Anyone with a valid email address may cast one (1) vote, so choose your haunt wisely! 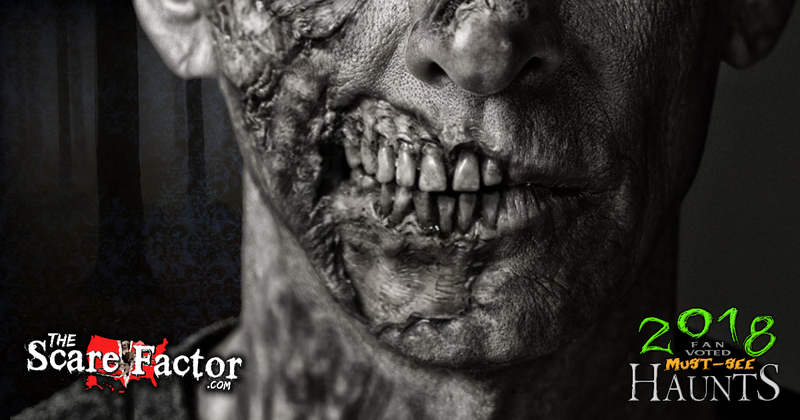 To vote, click the name of any haunted attraction that’s listed in our Haunted House Directory. Then, click the “Vote” button to display the ballot for that attraction. Note: This will temporarily sign you up for our email list. You may receive future emails from The Scare Factor with updated voting stats, lists of the haunts that won, and offers to join our regular email list (which you can learn more about here). If your haunt is listed in our Haunted House Directory, then you’re eligible to participate and receive votes! If your haunt is NOT listed, or the info on file needs an update, contact us here and we’ll help you get squared away. Just a heads up… You must have, at minimum, a website or Facebook page that we can link to. We thank you for participating and encourage you to share this event with your fans to help let them know that voting is underway! While the poll is running, we’ll publish periodic blog posts to keep you updated on the results. Similar to last year, the final results will be released on a State-by-State basis shortly after the poll ends (which, again, is July 29th… it’s a Sunday). It may take a week or two for us to create and publish all of the lists and promotional artwork, so please bear with us during this time. The haunts who receive the most votes will be awarded a spot on our prestigious “Top 31 Fan-Voted Must-See Haunts” list and offered a special website badge. Be sure to like and follow our Facebook Page and sign up for Haunt Advisor to stay updated! If votes are submitted for attraction(s) that are located in countries other than the United States (such as Canada), there must be a minimum of three (3) participating attractions before we will create a list of results and/or badges for them. – A minimum of three (3) haunts from any given State must have received votes to justify creating a list. – A maximum of ten (10) attractions will be included in any single State’s list of results. Fairness and accuracy are of the utmost importance to us, so we will be taking measures to protect the results from fraud. We will be monitoring the votes and notable attractions’ websites and social media pages throughout the duration of the poll. If we believe that an unreasonable number of votes have been cast with the intent of unfairly raising an attraction’s results, we reserve the right to disqualify any votes or the attraction(s) entirely without obligation to provide reason or compensation. If you have questions, you can contact us here or email us at TheScareFactor@Gmail.com. Thanks again for participating in our 2018 Top 31 Fan-Voted “Must See” Haunts poll! We appreciate your participation and cooperation to make this a great promotional event for the Haunted Attraction Industry.